Current range: 5 mA to 40 mA (2 V regulation). Strike voltage: 115 V (average), 133 V max. Cathode is wired to pin 2, Anode to pin 5. Photograph left shows the tube operating at 30 mA DC. Running voltage is 107 V for this particular tube. The outer cylinder is the cathode, and the glow discharge is mostly associated with its inner surface. The anode is in the centre. Right: Bulk gas discharge obtained by placing the tube in a strong RF electric field. The fill gas appears to be pure argon. The setup for obtaining the bulk discharge is shown below. The field source is a coil self-resonating at about 25 MHz. 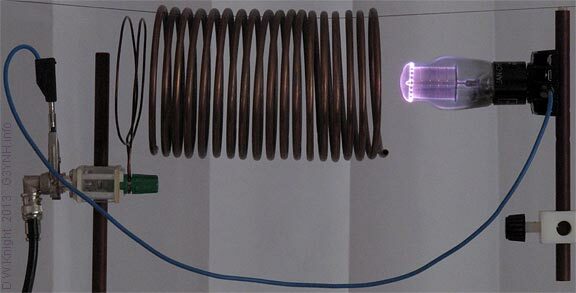 The tube cathode (outer electrode) is grounded to increase the field gradient and enhance the glow. See coil resonance experiments for more information. This tube has a special protective base (probably intended for rough service). 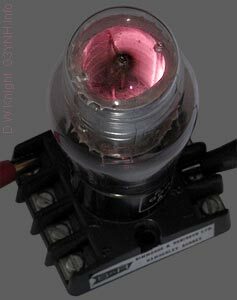 Inside the bulb, it is practically identical to the OC3 shown above.